2014 was a record year for the wind industry, with annual installations crossing the 50 GW mark for the first time. It was also the first year that Asia overtook Europe as the region with the most deployed wind capacity. Much of this was driven by the phenomenal growth of the Chinese market. The Global Wind Energy Council (GWEC) recently reported that the wind market in China grew by 45% in 2014, with an impressive 23GW of new wind power installed. With China expected to raise new energy development targets for the 2016-2020 period, this rate of progress shows no signs of slowing down. This year of 2015 alone, China will install an estimated 23-25 GW of wind energy, accounting for nearly half of all global wind installations. Wind power has overtaken nuclear power in China, in fact, at full pace, China’s wind farms could now produce more energy than all of the nuclear power plants in the US. GlobalData analysts also believe that China could overtake the US as the leading generator of wind power as soon as 2016. However, China will still have to overcome several hurdles in order to increase renewable energy production. 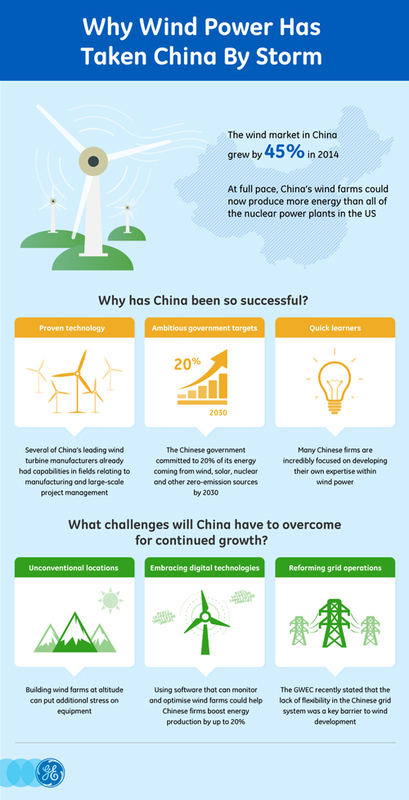 With this in mind, we examine the factors that have allowed China to deploy wind power so successfully, and the challenges it will need to address in order to continue to progress. One of the reasons that the Chinese wind turbine industry has been able to progress so rapidly is that several of the leading firms were large heavy-machinery manufacturers and utility firms, which already had capabilities in fields relating to manufacturing, as well as in large-scale project management for deployment. In addition, licensing agreements between Chinese firms and European design houses have proved an effective method of driving forward technological advancements, allowing Chinese lead firms to develop technology using the pre-existing expertise of foreign partners. Last year the Chinese government committed to 20% of its energy coming from wind, solar, nuclear and other zero-emission sources by 2030. Beijing also says it plans to increase China’s wind power capacity to 200,000 MW by 2020. In comparison, nuclear is only predicted to rise to 58,000 MW over that period. The government is also focused on cutting the cost of wind power so it can compete with the ‘golden standard’ set by nuclear and the low costs now experienced by coal. With recent reductions in wind subsidies, the government continues to place higher demands on technology including greater efficiency and reliability and most importantly, MW hours. From our experience, Chinese firms tend to work in a much faster and more agile manner, learning quickly, trying different techniques and learning from experience. The country also benefits from a number of state owned organisations which are incredibly focused on developing their own expertise within wind power, ensuring that new skills, techniques and technologies are adopted across the country. All of this helps accelerate new wind farm deployments. As wind farms become saturated in densely populated areas, many wind firms are forced to move to more remote and less conventional locations. Offshore is one of the areas where expansion is possible; here wind power could remain close enough to demand centres such as the big coastal cities, but would be away from residential areas. However, offshore does also present a number of logistical complications, from initially building the farms through to issues with servicing and maintenance. A large storm may put you down for three weeks if the conditions remain unfavourable. Constructing wind farms at high altitude is another option. However, this puts additional stress on the equipment. As the air gets thinner due to the reduced pressure, it loses some of its insulating properties, meaning that equipment built to work at high altitudes needs to be designed with sufficient safety spacing distances to prevent high voltage arcs or breakdowns between conductors and other electronic components. Cosmic rays are also more pronounced at higher altitude. These interact with silicon in such a way that they can cause it to puncture, which in turn, can cause the converters to fail. Therefore, additional technological considerations need to be taken into account in some regions. Embracing new technologies, such as software that can monitor and optimize the wind farm as it generates electricity, could help Chinese firms to boost a wind farm’s energy production by as much as 20 percent and create $100 million in extra value over the lifetime of a 100 megawatt farm. It works by installing dozens of sensors inside each turbine, which monitor everything from the yaw of the nacelle, to the torque of the generator and the speed of the blade tips. This data can then be used to optimize the wind equipment and power output. A select number of companies in the region have already embraced this new technology. For example, GE’s Brilliant wind turbines, which harness the power of the Industrial Internet to analyse tens of thousands of data points every second, have been installed at the Huaneng Corporation’s Huaneng Dali Longquan wind farm in the Yunnan province of China. The challenge for wind companies throughout China, however, is to select partners with the technological expertise to drive innovation in the market and bring high-quality, reliable power to the region for many years to come. Large distances between wind farm locations and areas of demand are also an issue due to the need for investment to improve transmission and distribution capacity. While the government is adding new transmission lines, the integration to the grid network remains one of the most serious challenges facing the wind industry in China. A recent report from the GWEC stated that the lack of flexibility in the grid system, coupled with general lack of a real electricity market where electricity can be traded, were some of the key barriers to wind development. For example, northern China boasts good wind resources, but rapid development of wind power in this area has outpaced the local grid, leading to substantial requirement to curtail excess wind power. To help overcome this, a number of new transmission lines need to be developed, in order to link power from its source to its demand centre. The rapid development of the wind power industry has created a new set of challenges for China to address. Despite this, the GWEC still predicts that China will install an additional 100 GW by the end of 2019, exceeding the country’s 200 GW target for 2020 a year ahead of time. To grow sustainably to meet this target, wind companies throughout the region must develop long-term partnerships with industry experts, such as GE, at every phase, from conception and design to installation and continued optimization and maintenance, to drive innovation and efficiency. If this collaboration continues the future will be bright for the Chinese wind industry.